Feeling hungry? Peckish, looking for a bite? Oxford has all sorts of tasty choices! To start your day, why not begin with a traditional breakfast at Mr. Chubbs, on LaFayette Park. Hot brewed coffee; eggs your way; french toast; pancakes; the choice is yours. Owners Michael & Julie Andrus start their day at 7:00am, and they welcome families. They serve breakfast thru lunch, closing at 2:00pm. They're closed on Sundays. On Sundays, however, you can still get a great breakfast at the American Legion-Post #376, at 17 S. Washington Avenue, until 11 AM. The Legionnaires are early risers whipping up eggs, bacon, pancakes, and more. offering full service, family oriented dining with hearty meals, friendly service, and ice cream. Breakfasts- eggs on platters/sandwiches, buttermilk pancakes, French toast, and when available, quiche. They make all sorts of sandwiches, melts, paninis, salads, and vegetarian selections for lunch. Dinners are specials such as Ham and Pierogies, Hot Turkey Sandwich (with their house cranberry apple stuffing and homemade lumpy potatoes), or Meatloaf with vegetables. They have a wide variety of Boar's Head Meat and Cheeses complimented with Boar's Head Signature Sub Sauces! home of the Giant Stadium Burger. The Stadium is your hometown neighborhood grill, serving lunch, dinner, and late night daily with a friendly staff and pub atmosphere. 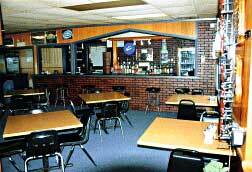 Offering a wide variety of menu options as well as daily specials. There the Thursday Wings Special (from 4 p.m. to 10 p.m.), $7/doz. or the Friday night tender Baby Back Ribs or their always Fresh hand battered Haddock! Save room for desserts because they have delectables like cheesecake, PB Brownie Torte, and Fried Snickers! A "Great bar with really good food." Subway, located inside the Mirabito Quickway, at 10 N Canal St, Oxford, NY. Casual counter-serve chain for build-your-own sandwiches & salads, with health-conscious options. They also make breakfast sandwiches with eggs with Black Forest ham, cheese or even steak! If you're playing a round of golf at the Blue Stone Golf Club, they serve lunch there too. The Clubhouse has a casual, dark pub feel, and is the perfect spot to unwind and enjoy your favorite beverage from the full bar, or feast on juicy grilled burgers, hot dogs, or salad sandwiches. It's a great out-of-the-way place for a get together even if you don't have time to tee off. They're serving lunch and dinner until the sun goes down (and you can't play golf anymore). While you're relaxing, you can watch your favorite sporting event on the big screen TV or gaze out the window at the players on the green. If you're lucky, you just might spy a golf loving red fox! If you're in a hurry, there's fast food at the ready. The Nice N Easy, at 36 North Canal Street, sells pizza, subs, & soda. They can even whip up some fresh made deli subs and sandwiches in a jiffy. For lunch or dinner, for dine in or carry out, Benvenuti --Roma's Restaurant & Pizzeria. The intoxicating aroma of roasting garlic and Italian bread wafts out their door at the corner of South Canal & Main Streets. They're always packed, and seating is limited, so dinner reservations are a must! If you're in the mood for a real sophisticated treat, they will prepare fantastic "classical Cucina Italiana" specialties such as Veal Livornese, Shrimp Siciliano, and Chicken Florentina to order. To round out the experience they do have some nice house wines too. 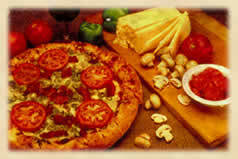 Naturally they offer lasagna, calzones, pizzas, and other ever popular favorites. All creations are made in-house, using the freshest garlic, basil, cheeses and other fine ingredients. Don't forget the dinner rolls, they're delicious. (Call ahead for take-out orders; it usually takes 25 minutes.) As owner Michael Barone says, "It may take a little longer, but your patience will be rewarded." This is very true! They even have a decadent assortment of desserts (if you have room), like Amaretto-Almond Cheesecake and Ti-Ra-Mi-Su. They're open every day of the week, Monday through Saturday 11:00am - 10:00pm; and Sunday 12-Noon - 10:00pm. They also cater. Buon Appetito!